Skaros was one of the five fortified settlements and the most important one. The rock was inhabited in medieval times, because the fortress constructed there offered protection from pirates. The original castle, known as ‘Epano Kastro’ (Upper castle in Greek) or 'La Roka' was built in the later Byzantine years by the Venetian Giacomo Barozzi. The first Duke of Naxos Marco Sanudo gave Santorini to Giacomo Barozzi in the year of 1207. A whole settlement was built around and below Epano Kastro, the 'Kasteli' of Skaros. The densely populated Catholic settlement had 200 houses, and to reach its walls required at least half an hour’s walk. At the top of the rock hung a large bell, to warn inhabitants of imminent pirate raids. 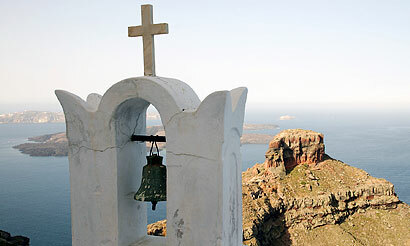 The promontory at Skaros has been shaken repeatedly by strong earthquakes. Historical sources say that earthquakes during the eruptions of 1650, 1701 to 1711, and 1866 to 1870 caused considerable damage. The Venetian noble families that lived there decided to leave after the eruptions of 1707 to 1711. Skaros was the capital of Santorini until the 18th century, although evacuation of Skaros started at the beginning of the 17th century. The rich Roman Catholics who had once lived there had moved to the town of Fira, abandoning the castle for a lower flatter level with access to the sea. “I am now seated in front of the ducal castle of Skaro; my position is under a huge step of red lava and slag, which supports part of Merovouli (Imerovigli). The promontory of Skaro is separated from me by a high ridge which connects it with the main land; its formation is striking as to colour and shape, being of dark grey, and red lava mixed up with ashes, pumice and pozzolana; its most elevated part is a great red and black crag with a flat top rising 1000 feet above the waters of the gulf, which from time to time has been much diminished, as the earthquakes have shaken down large fragments into the sea. Around this crag are the houses of the now ruined town of Skaro, a most extraordinary group, perched one over another where a crevice in the sides of the precipice will admit of it, and in most frightful positions, the out wall of the buildings being in a line with the perpendicular rocks. I sprung a covey of partridges among this mass of ruins, and was once near falling into a vault full of skulls and other human bones; now a living soul now inhabits this place”. SKAROS WAS A MEDIEVAL FORTRESS WITH A THRIVING CATHOLIC SETTLEMENT. THE CALDERA WALL BETWEEN SKAROS ROCK (LEFT) & IMEROVIGLI. AT THAT TIME SKAROS WAS STILL POPULATED..